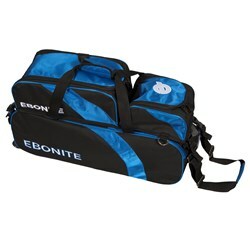 Join Team Ebonite and get one of their slim triple tote/roller bowling bags! 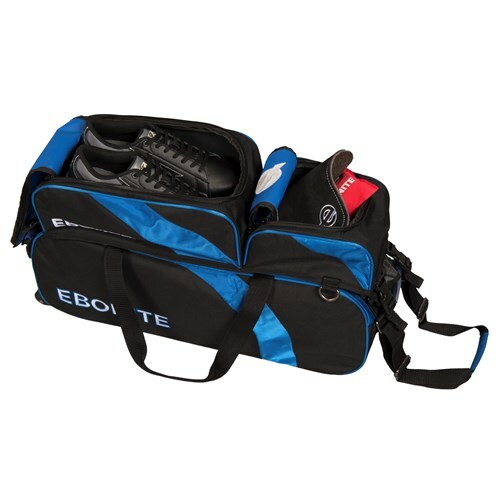 The Equinox Slim Triple Tote/Roller bowling bag is packed with lots of high performance features that will solve all of your bowling tournament travel bag needs. 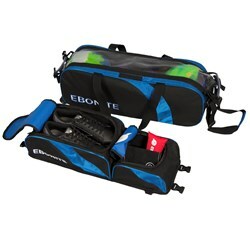 This tough and durable bag is made of a 600D material, Wide base with colorful 1.25" inline wheels. End pick-up handles on both ends make this bag easy to get in and out of your car or from the baggage claim while the adjustable tow strap makes the bag easy to pull. After adding 3 balls and accessories, this bag can weigh up to 50 lbs and this bag does not include a shoulder strap. This tote/roller includes padded pulling straps. Yes, it will detach from the bag. It is attached with clips. Is this bag available with out the shoe pouch? Unfortunately, it is only available with the shoe pouch. Due to the time it takes to produce the Ebonite Equinox Slim Triple Tote w/ Shoe Pouch Black/Blue ball it will ship in immediately. We cannot ship this ball outside the United States.